Become a Fan of our Fans! Our White Decorated Wedding Fans are perfect for weddings and party favours. 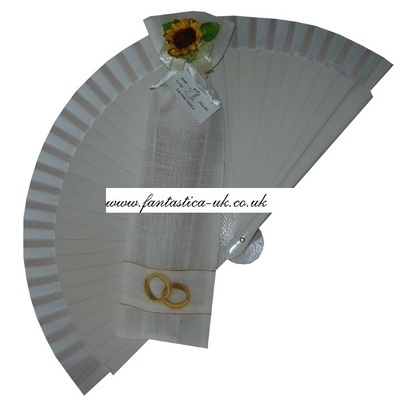 Made from a white wooden frame with white fabric edge, these fans come with a white organza bag beautifully decorated with sunflowers and entwined gold rings. Free personalised cards on order quantities over 30 units. 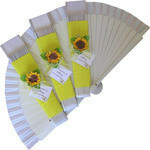 All decorated wedding fans are handmade therefore, please allow up to 2 weeks for delivery. VAT Reg No. GB 935 1597 05 © 2007-2016. Fantastica UK. All rights reserved.